Zoffany’s informal conversation piece is a fascinating glimpse into the colonial life of 1780s Bengal. 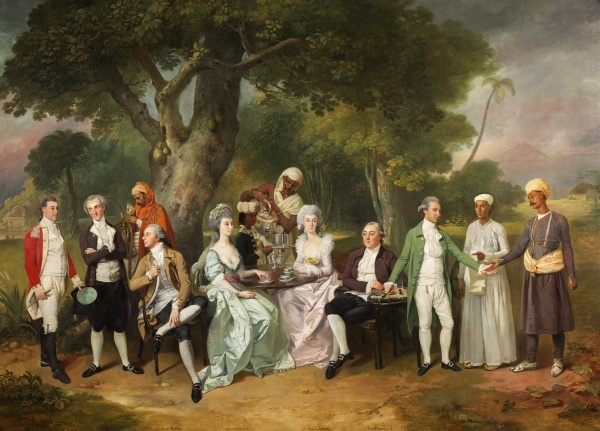 This tea party under a jackfruit tree is probably set in the garden of James Peter Auriol (in green, on the right), an administrator in the East India Company. His sisters are seated between their new husbands, with two more brothers on the left. The painting shows how the fashionable British way of life continued unchanged in the heat of the Indian subcontinent, thanks to an army of servants. The Indians here represent several different ranks, from page-boy to accountant.